Good day pals. 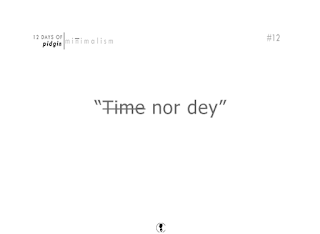 A couple of weeks back I embarked on a 12days journey (though it took a bit more than 12days), during this 12days, what I did was to depict some favorites when it comes to pidgin slangs that have come to be over time, creatively with my visual identity skill. Without ado, let's go. 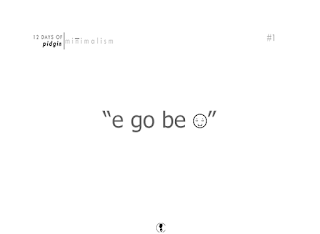 "E go be o" means literally see you later in a stylish manner of "at last". So herein I write it out in text and an emoji I handcrafted that seem like someone letting out a sigh of relief. 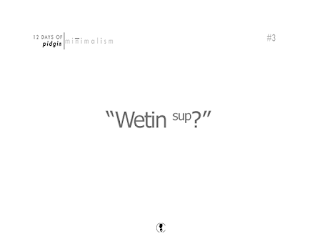 "wetin sup?" means what happened? huh? 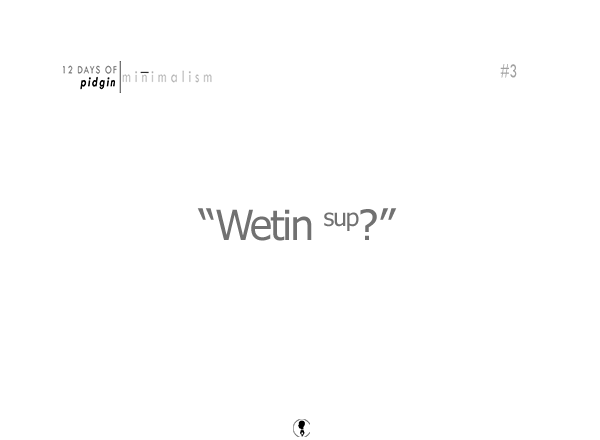 in this case, I leave things really simple, to format a text to sup in any digital too is to raise it up, hence why I depicted this that way. 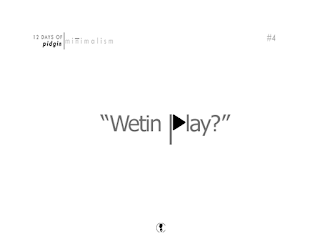 "Wetin play" is almost like "wetin sup" just that it's like the permanent past tense for it. 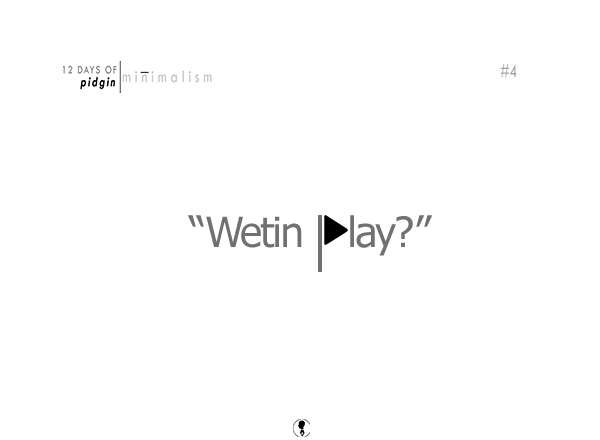 In this case, I write the P with the universal Play icon in play. "Everywhere good" means what it means, lacking only the necessary is that's needed in proper English. In this particular one, it is stylishly written with a mark carefully placed underneath the double oo in good to form the image of a face wearing a sly smile. 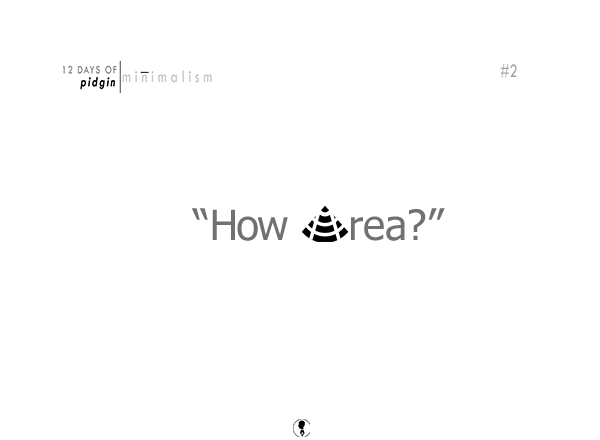 I'm pretty sure you missed that, look again. 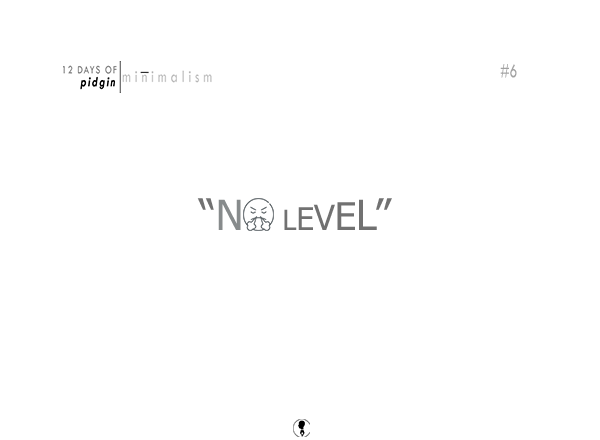 "No level" means no regards given to the subject, so there's an emoji representing fury and I don't give a damn replacing the o in no while the level is written in levels. 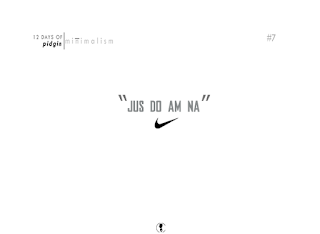 "Jus do am na" translates to just do it already. Simply written with Nike's logomark placed right beneath, standing for their slogan: Just do it. "Kasala don burst" translates to trouble erupts. In this case, I did not write it fully but wrote just kasala don then thereafter depicted the burst with a background burst. 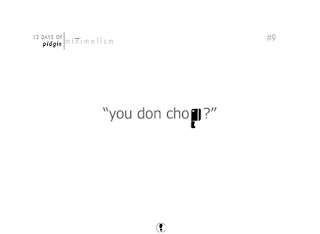 "You don chop" means have you eaten? 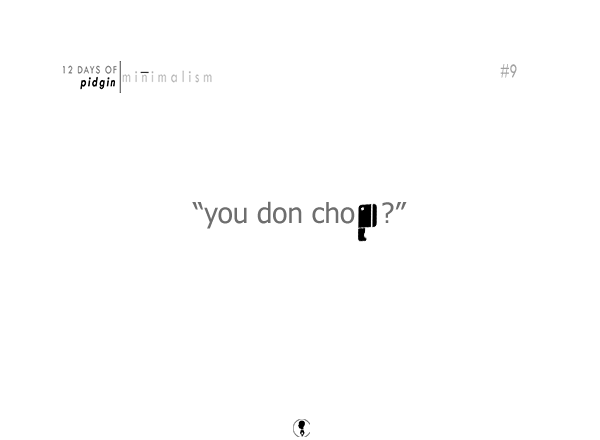 well, in this case, I represent chop as what it really is which is to cut, hence why the type of knife representing the p in chop. 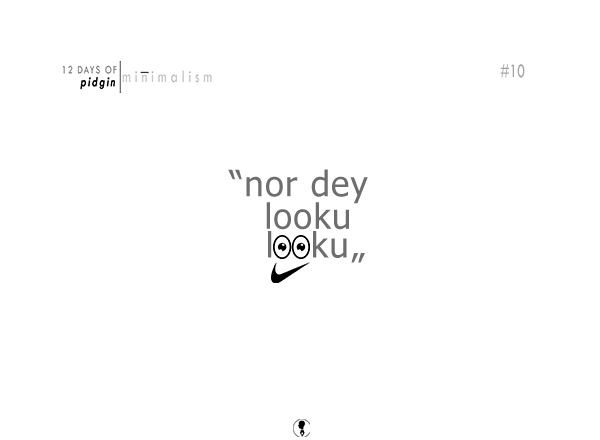 "Nor dey looku looku" means stop drooling. 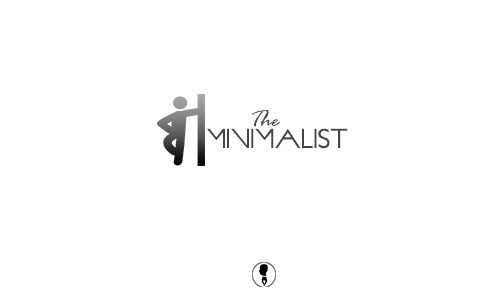 Simply written with the last looku having eyes as it's double oo. And Nike's logo was once again strategically placed underneath to form a face of a toad like a cartoon staring obsessively. 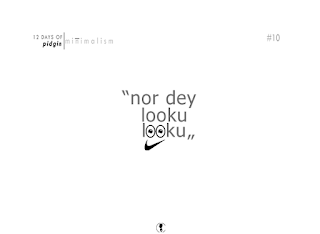 The Nike's logomark helped achieve the face and says: Stop drooling, just do it! 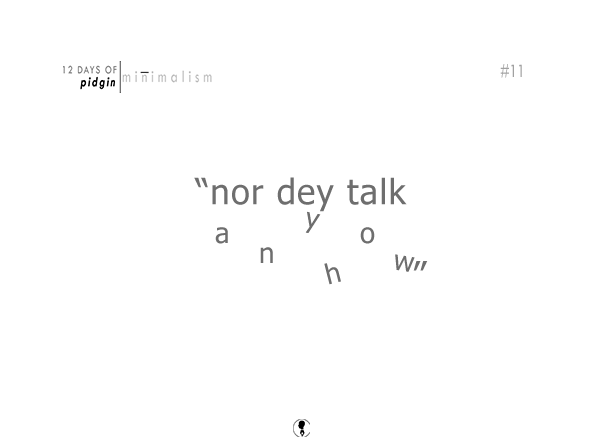 "Nor dey talk anyhow" means stop speaking irrationally (anyhow). Well, anyhow, in this case, was surely written anyhow. 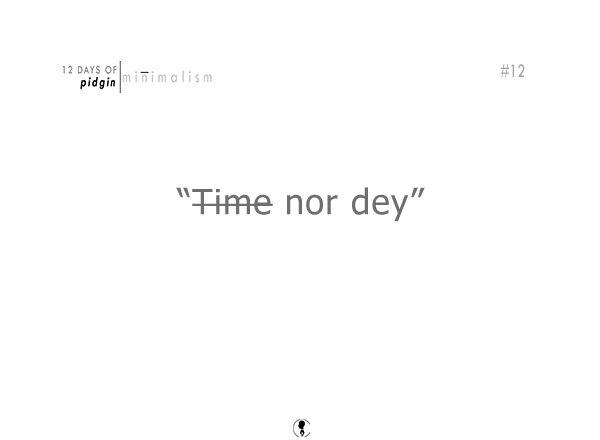 "Time nor dey" means time waits for no man! 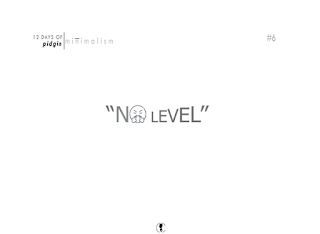 no time. Basically why the illusion of there being time was canceled herein. 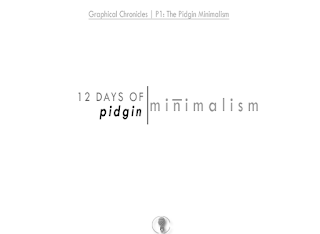 And that's it for 12days of pidgin minimalism. What do you think? let me have your boos and nudges, I remain your sweet boy, hope you enjoyed this little journey! P.S. : You know deep inside that you want to share this post, just do am na! 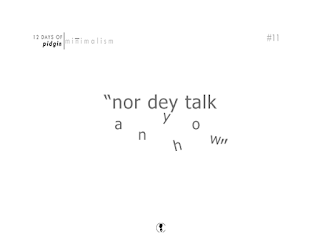 pidgin/ˈpɪdʒɪn/ a grammatically simplified form of a language, typically English, Dutch, or Portuguese, some elements of which are taken from local languages, used for communication between people not sharing a common language.